https://nicebeauty.com/eu/yves-saint-laurent-touche-eclat-type-1-5-2-5-ml.html 56338 YSL Touche Éclat Radiant Touch - 2,5 Vanille Lumiére 35.00 7 EUR InStock /Brands/Yves Saint Laurent 0 YSL Touche Éclat Radiant Touch is a fantastic and absolutely essential light brown product. It can both be used to hide and highlight certain elements of the face. This is the secret to a beautiful and flawless look, but a fresh and youthful glow. With the YSL Touche Éclat Radiant Touch you can remove dark edges, fine lines and signs of fatigue, with just a few strategic strokes. This highlighter contains caffeine, which is refreshing on the skin. 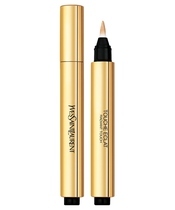 YSL Touche Éclat Radiant Touch is a fantastic and absolutely essential light brown product. It can both be used to hide and highlight certain elements of the face. This is the secret to a beautiful and flawless look, but a fresh and youthful glow. 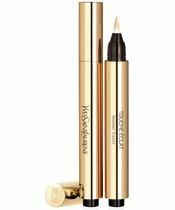 With the YSL Touche Éclat Radiant Touch you can remove dark edges, fine lines and signs of fatigue, with just a few strategic strokes. This highlighter contains caffeine, which is refreshing on the skin.